One last Christmas giveaway! Isn’t the bag so cute? <3 Read more for three simple steps to join! 1. Like One Day AND XOXO, Len on Facebook. +5, post this as your Facebook status: “OMG! 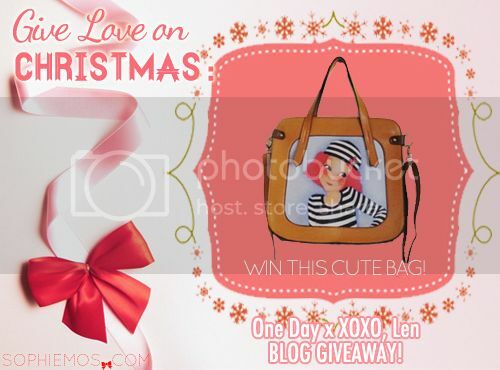 I want to win that cute bag from @XOXO, Len at www.sophiemos.com! Check @One Day to win amazing prizes!” Make sure you tag One Day AND XOXO, Len. Also make sure your account is set on public, so that I can verify it. Contest period is until January 18, 2012, Friday, 11:59 pm. Winners will be chosen via random.org and will announced on my blog/twitter. Best of luck everyone!